There was nothing but white noise. I was standing in the centre of it, shaking from the adrenalin that surged through me with the fear of slipping as I jumped from one wet rock to another, trying to keep myself steady while holding a 44-metre spread of sixty words that were weighty with water. At the far end of the string I could see Rob’s lips moving but his words were drowned out. My ears were full of white noise. The water in front of me rushed past in a blur. But the string of blue above it held a sublime and gentle presence, the cloths swaying in the light breeze, holding their place while all around them raged. Here beside the river it is as if I am in an echo chamber. Noises from beyond cannot be heard, but more than this, they become forgotten. This river and its noise forces me into the continuous present that is, for the Langstrath Birch, the single reality. There is always the river, and always the white noise. A month ago Rob and I were here to plan out the details of this installation, specifically to measure the distance from the Langstrath Birch to the rock that is our favoured ‘viewing station’ (and incidentally now has a geocache hidden by it). An earlier blog (here) explains our thinking. We have been allocating a colour to each of the seven trees and linking each one to a particular sense or emotion, following the symbolism of the Indian Chakra System. Blue is associated with communication. Standing on the rocks here, many, many times over the last two years, we have always been surrounded by the white rage of the river, and rising above it, the single silver birch. We asked ourselves, what does rise above the white noise? Right here, it is the tree itself, a tree that procreates through the release of winged seeds or ‘samara’. A healthy mature birch tree releases millions of samara each year that are dispersed in wind and by water to find root elsewhere. As a pioneer species, birch is able to ‘take’ easily, even where soil is dry, dusty, or deprived of nutrients. Its tiny seeds are its way of communicating. 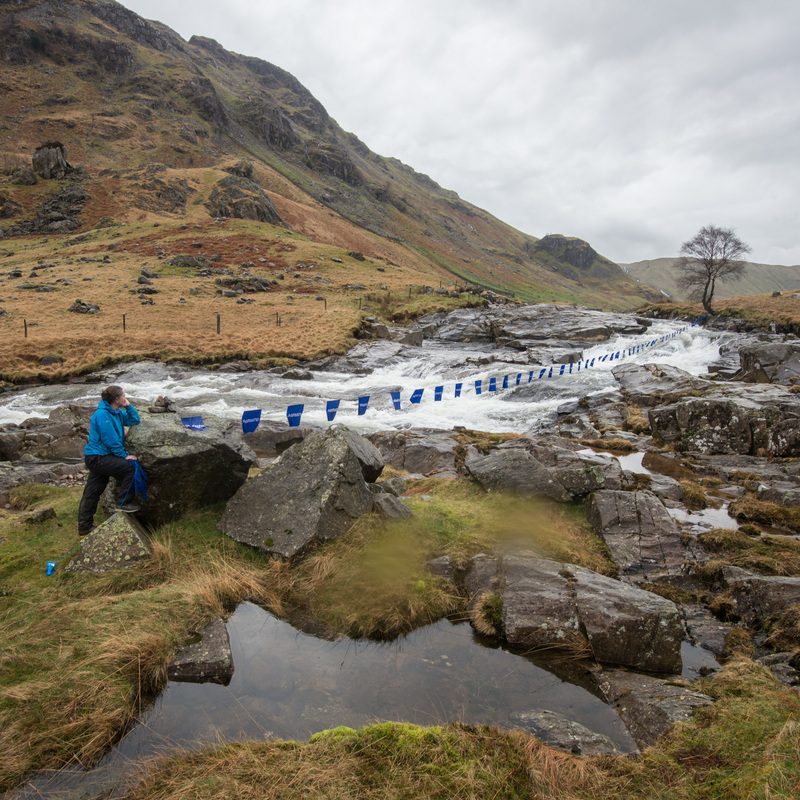 I hadn’t expected the task of holding a simple line of blue cloth above the river to be quite as challenging as it was. When I relaxed the line and let the cloths touch the surface of the water I felt the incredible force of the flow. I became part of the fight against it. When the line was taught and the cloths were hanging calmly, there was a beauty and delicacy about it, a dramatic contrast to the struggle of pulling them out of the raging torrent. In our planning of this installation I had contemplated what happens in a single minute – the time it takes for water to flow from the tree to the viewing point – in terms of information shared, particularly via social media. Millions of messages, images, videos, opinions, all variations of ‘truth’. It is hard, and seems to be getting ever harder, with the increase of social media, to decipher what is true, what is false, what is distorted and even what to do with the ‘facts’. Each one of us exists within our own echo chamber: we tend to surround ourselves with like-minded people and listen to the voices and opinions of those who agree with us, and when we are online we are shown adverts and newsfeeds that are catered to our points of view and our interests. The effort needed to tune into and focus on viewpoints beyond our own is considerable. It is uncanny sometimes how things work out. Doing a site-specific installation demands a lot of planning, getting to know a place, measuring, and then working with the weather. What we hadn’t planned for was the arrival, after we had wound the cloth back in and taken our sandwiches out to have a bite to eat, of Joe Weir, a farmer who is one of the commoners whose sheep graze in the Borrowdale Valley. Joe was coming up the valley on his quad bike, with his five lithe dogs, to check how things are going beyond the fell wall. We’ve known Joe from meetings at shows and other events over the past five years, so we walked up to the trail to say hello. We ask how his ewes are – they’ve been scanned now and will be lambing soon – and chat about the past year. Joe fills us in on what’s happening in Borrowdale and we talk about the tree planting in the valley that has been done with the National Trust. We can see the sturdy wooden cages up on the fell beyond us that keep red deer and sheep away from young trees that, all being well, will become veterans of the future. I ask about the different flocks and farms that share the common land here, and Joe points out whose sheep go where. He maps the valley with the names of those who know its bogs, rocks, curves and rises well. I get a feel for it as a land of hefts, invisible borders held on fenceless fells as if stitched by footsteps of farmers and the flow of sheep from one side of the watershed to the other. We talk about the continual challenge of working out a way to find a balance here in the fells, where commoning can continue beside rich biodiversity. 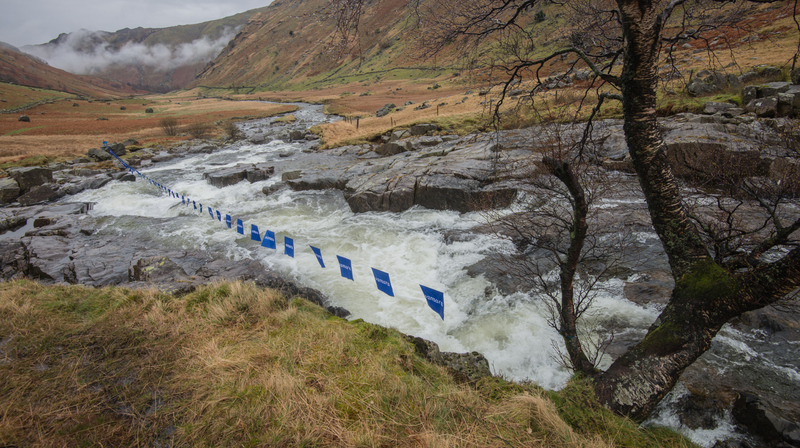 We discuss flooding and the likelihood of more flood events in the future, the development of hydro projects in Borrowdale, and even what’s happening at Sellafield. Before Rob and I get round to telling Joe about the string of blue above the water, he talks about the difficulty of getting accurate facts heard, particularly when it comes to decisions about land management and land use. Who hears what information, and what is done with it? Which voices are listened to and acted on? 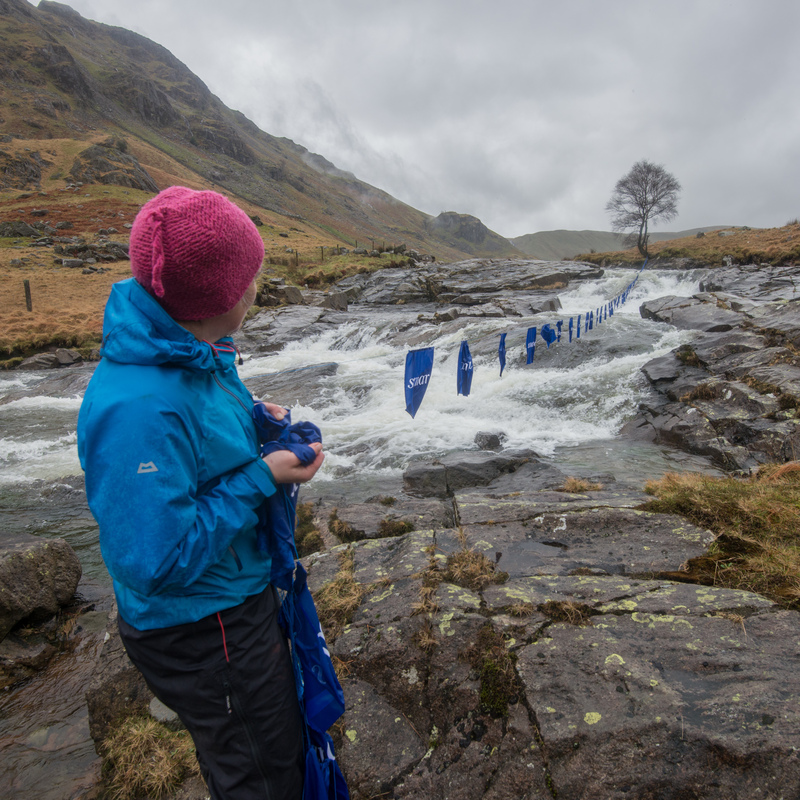 The challenge of finding balance in valleys like Borrowdale is not new, but perhaps now more than ever, with the pressures of flood risk and the uncertainty of policy changes in the face of Brexit, clear communication is needed. This installation, the simple stringing of the word samara, repeated, above the river, began as a way of asking how hard it is for the environment, and nature, to have a voice above the ‘white noise’ of multiple truths and globalisation in a busy twenty-first century. In the process of putting it in place it did this, but it also found relevance at a local level: the very real truth of the force of a river and one single tree, and the people who come past it day after day, generation after generation, and have their own stories to tell about a valley they know intimately.